A Winter Jacket for Genesis 2 Male for use in Daz Studio 4.6. Morph for open and close Jacket. Thank you so much! Using your beautiful deigns to create my illustrations! Thank you once again. Nice to find more clothing for the guys. So nice to have winter wear for the guys. Thank you. Nicely done, thank you and Happy Holidays! Nice jacket, nice textures! Thank you very much! This is great, now my GM can stay warm, lol. Sweet! Can't have enough G2M items, thanks! Thanks. I probably don't say that enough, but you are my favorite freebie maker! You're awesome! 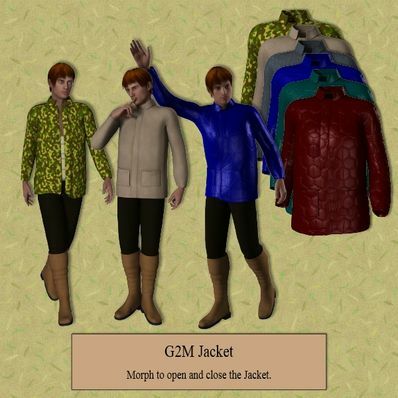 create a jacket, very good idea Thank you! OH... this is wonderful... Just what my guy needed... THANK YOU!!! Happy Holidayzzzzzzzzzz!